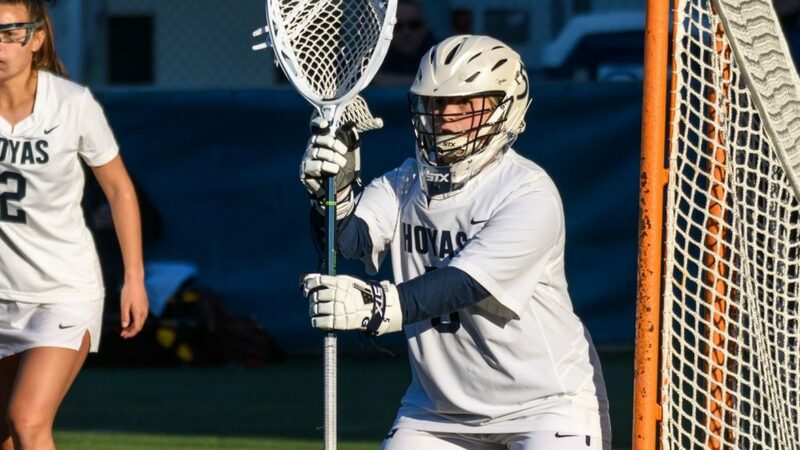 The Georgetown women’s lacrosse team fell 16-9 against No. 13 Navy on Wednesday night at Cooper Field. 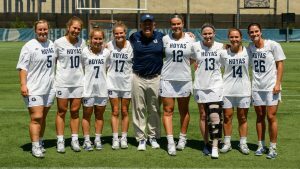 Sophomore attacker Nicole Victory notched five goals for the Midshipmen, junior attacker Kelly Larkin added four goals to go along with six assists, and junior midfielder Annalise Heyward and sophomore midfielder Marina Lazarides, each had a hat trick. For the Hoyas, junior attacker Michaela Bruno, senior midfielder Francesca Whitehurst, and senior attacker Taylor Gebhardt had two goals each. The game started well for Georgetown (7-6, 1-1 Big East) with Bruno striking the first blow after 53 seconds, but Navy (10-3, 4-1 Patriot) responded immediately, taking the ensuing draw and winning a free position shot that Heyward put away for 1-1. 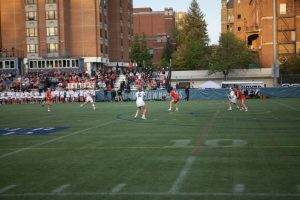 From there, the game slowed as both defenses held firm, but senior defender Megan Massimino went down injured while chasing a Navy attacker in transition and was forced to miss the rest of the game. Eventually, Victory would score in the 18th minute to make it 2-1 before Larkin scored again in the same minute to give Navy a 3-1 lead. Senior attacker Morgan Ryan added a second for the Hoyas, and in the 20th minute, Whitehurst scored to even the score at three. Navy would finish the half on the front foot, with Lazarides and Larkin scoring to end the half, but Navy’s two-goal lead was largely thanks to eight saves from senior goalkeeper Gab Harchelroad. Despite having six more shots, Georgetown’s continued shooting struggles meant that Navy held a 5-3 halftime lead. The Midshipmen extended their lead in the opening minute of the second half with a goal from sophomore attacker Ellie Lecker before Gebhardt scored two quick goals to make it 6-5. For the next five minutes, the two teams would trade goals, first Larkin for Navy, then junior attacker Emily Ehle for Georgetown, then a response from Heyward, before Whitehurst made it 8-7 after Bruno improvised on a broken play. Lazarides and Larkin scored back-to-back goals before freshman attacker Ali Diamond looked to put the wind back in Georgetown’s sails at 10-8. From there, though, the Hoyas fell apart. Three goals from Victory, one from Heyward, one from Lazarides, and a final one from Victory capped off a 6-0 Navy run, putting the game out of reach. Bruno got a consolation, but the Hoyas slumped to another defeat. 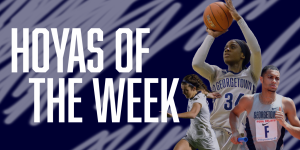 Georgetown looks to bounce back at Villanova (8-5, 2-0 Big East), as well as grab a foothold in the Big East race. For coverage of that game, as well as all of Georgetown’s athletic programs, follow @GUVoiceSports on Twitter. Jorge DeNeve Los Angeles native. Still wondering where the Galaxy went wrong and decided buying Jermaine Jones was a good idea.